Wow! Can’t believe that I haven’t written anything for over a week now. I wanna blame it on traveling and exhaustion – but the truth is that I was simply lazy to do so. I am in Singapore now. Today is my third day here. 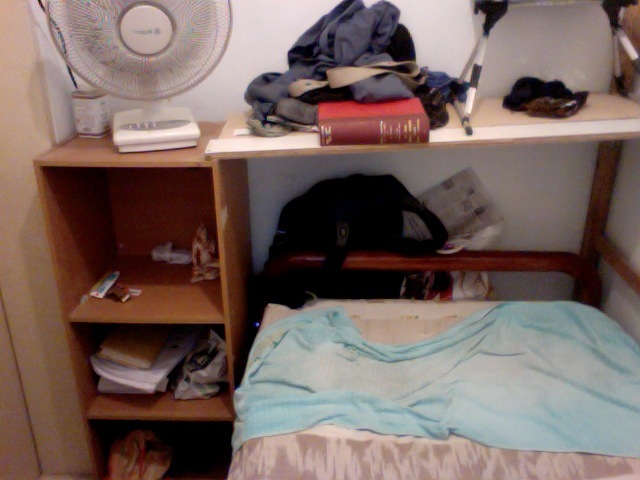 I’m living in the world’s smallest room. It’s so small that the only free space is the size of a box – even a dog would feel cramped in here. What’s more there is no window – which implies that there is no natural lighting. Every second of every day looks exactly the same. I can easily run experiments on human biological clock here – there is no way anyone can tell the time. I’m attaching a picture, just so that you know I’m not exaggerating. Apparently, rent is very expensive here. It’s after all a very small city – the total end to end length is hardly 35 kms. That’s nothing. Kottayam, my hometown and my no means a big city, is larger than this. But Singapore also has a huge population – over three million – a mix of Chinese (majority), Malay and Indian. On the very first day here, on my drive from Changi airport to the university, I asked my cab driver if people had private cars in Singapore. He told me that only the very rich had their own cars. The government requires every car owner to purchase a Certificate of Entitlement (COE! C – O – E! He emphasized it ten times before I got what he was saying) that in itself is worth over 50,000$ (sgd) This in addition to the cost of the car, taxes and insurance premiums make it inexorably expensive. God said “Let there be MRT” and Singapore was made. The MRT goes everywhere, is affordable and very clean. The bus service is equally good – all air conditioned and easily understood. I don’t see how anyone can get lost here – you’ll reach an MRT at least and then make your way to wherever you wanna go! But of course, being a hub of multi millionaires from all of South East Asia, I wasn’t surprised to find many private cars as well. God said “Let there be food”. And all was food. I had a Kaya toast for breakfast. With half boiled eggs and creamy coffee. I had chicken rice with roasted chicken for lunch with a side of Korean red bean curd. Followed by a soy green tea latte (Yumm!!!) from Starbucks. Yesterday’s lunch was grilled fish with butter rice. Tomorrow I’ll have some fish balls with noodles. All this has hardly cost me 10 $ (sgd). That’s approximately 8 USD!! It’s so cheap. In fact, people here – especially students and bachelors don’t cook at all – it’s as expensive to cook as it is to eat outside. I better phrase it like this: It’s as cheap to eat outside as it is to cook. So then why cook? It’s like every single cuisine in Asia converge on this one spot. It’s surprising that I don’t see a lot of Obese people around. Wouldn’t all this food make one fat? I am yet to see an eatery that was deserted. People eat everywhere. But maybe the key to this in the next bit of wisdom that my cab driver told me: Everyone works in Singapore. Nobody has to look for work. That would make sense – people eat and then work. In about three month’s I myself can testify to this. Either I’ll be a fat little pig or else will remain exactly as I am now. Will let you know!!! Perhaps I should start a separate blog on Singapore. I’ll fill it with pictures of food!!! I’m definitely buying a lot of Kaya from here. Will have to make this popular in the states. Wait and watch! !